Rachel Hoge is a Tennessee native who loves sweet tea and her family garden. She’s an MFA candidate at the University of Central Arkansas, an intern at the Oxford American, a ghostwriter on occasion, and a strong believer in the pseudonym. Her work has appeared or is forthcoming in Pembroke Magazine, Feminine Collective, and others. This is a tough subject, and the poet pulls no punches. 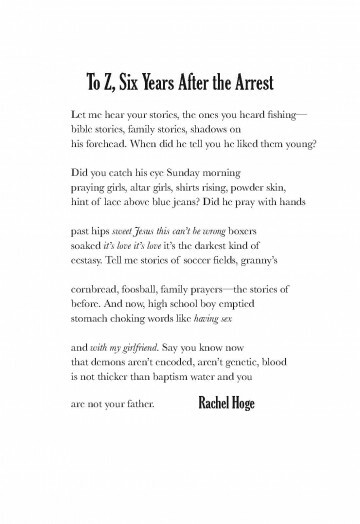 In fact, the crime itself takes up the very center of this poem, undermining all the childhood around it. But Hoge doesn’t dwell there. Instead she chooses to end with a break toward hope. Her speaker has been commanding Z to tell his stories—all of them, good and bad side by side as in life—drawing out the worst so she can cast out his fear: “demons aren’t encoded.” Best of all, though, the poet breaks the penultimate line after “you,” separating Z himself from the mention of his father in the last line. It’s a powerful reassurance for anyone who fears they’ll repeat the worst of their parents’ transgressions. “Let me hear your stories,” the speaker says to Z, and stories call for a classic book typeface. Baskerville’s smooth roman form won’t make the reader work too hard to read an already difficult tale; its italics add an outlandish shock (that capital J!) to stomach wrenching dialogue. The typeface for the title and poet’s name need to compliment Baskerville’s flare without competing. Gloucester’s ascenders have a similar rise above the midline, and its lower case letterforms—especially the g, a, and c—are clear cousins to Baskerville. The effect is an anchor both firm and gentle for the poem’s tumult.